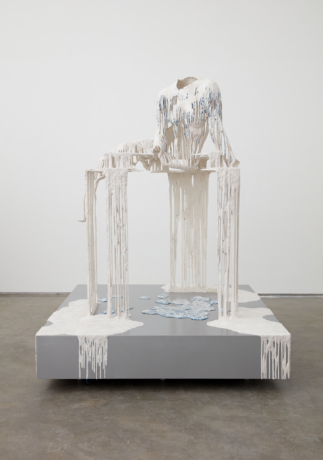 This exhibition features a selection of sculptures and wall reliefs by the Syrian-born artist Diana Al-Hadid, who currently works in Brooklyn. Meditations on ruination and renewal, her works contain allusions ranging from archaeological excavations and sacred frescoes, mosaics, or tapestries to female bodies that often appear as if they are melting or dissolving. These shimmering orchestrations of abstract elements, evocative surfaces, and symbolic forms—made from materials such as polymer gypsum, fiberglass, and cardboard—seem to have grown organically, with time’s accumulation and decay assisting the artist’s imagination in producing these works. Yet Al-Hadid’s process of fabrication and spirit of inquiry reveal a highly purposeful vision, inspired by a variety of sources, from Arabic literature to depictions of women throughout art history.